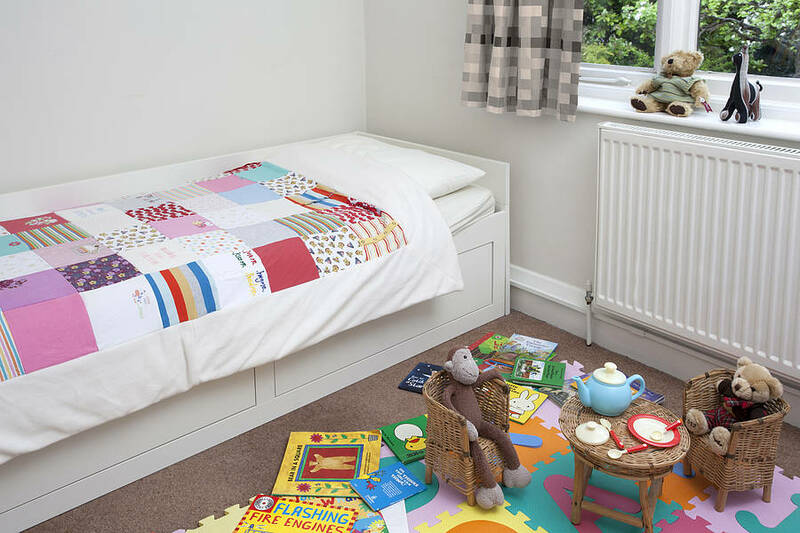 A beautiful handmade quilt created using your child's treasured old baby clothes. A wonderful and snuggly reminder of your child's babyhood. Either get one for yourself or use our 'Gift It' service. 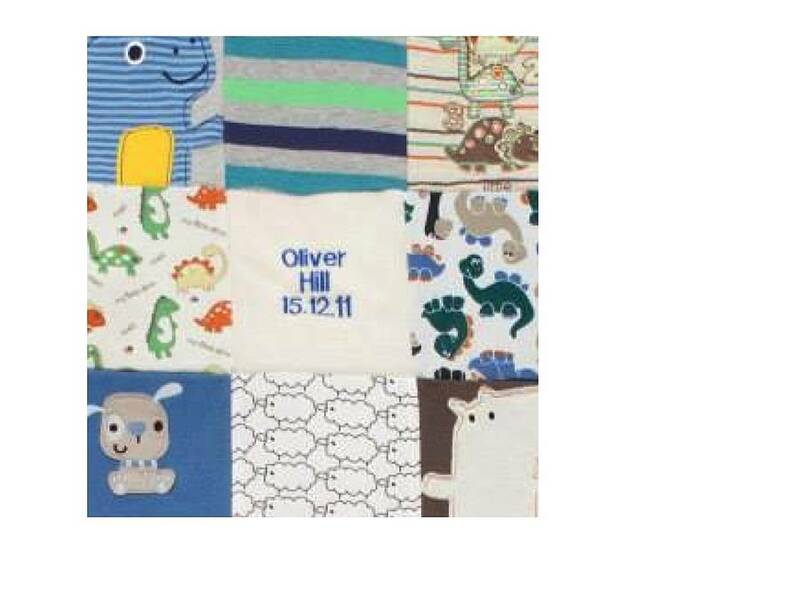 You send us your child's old baby clothes and we take the greatest care to create a totally unique quilt. With thick 4oz wadding and backed with lovely soft fleece, these make a beautiful addition to your child's room, or to be kept for yourself! Our quilts are a great way to get those baby clothes out of the attic and back in to your arms. Once your order is placed we will dispatch a pre-paid mail bag and order details to your shipping address. When you are ready to send the clothes in just pop them in the mailbag, along with the form and send them back to us via one of the shop locations listed in the details with the mail bag. You need to use the pre paid label within 12 months. If it is not used within that time you can still send us the clothes but you will need to pay for postage separately. Once we receive the clothes it usually takes around 4-6 weeks to create an animal keepsake (or a little longer in the run up to Christmas). We take the utmost care with your irreplaceable items. The cost of postage and personalisation is included in the cost. Please note the deadline to receive items in time for Christmas has now passed and all items ordered will be delivered after Christmas. Get one for yourself, or make it the perfect gift for new parents, christenings, birthdays or Christmas. Using our gift option we can send out our gift pack so that when parents are ready to part with those clothes they can send them straight in to us. All our keepsakes can be personalised with up to 45 characters of embroidery, usually the child's name and date of birth. On the quilt the embroidery appears on one of the panels. 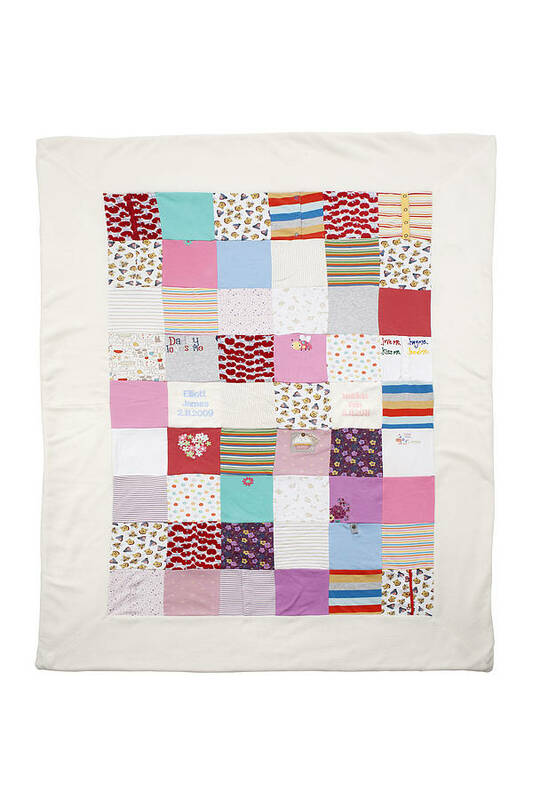 You need to send about 12-15 items of baby clothing for a cot bed quilt and 25-30 items for a single bed size quilt. For a double bed size we'd need 40-45, or 55-60 for a king size bed quilt. Obviously if the items are a bit larger or include blankets then we can manage with fewer. Please do contact us if you have any concerns or queries about what you are sending in. Often this might be babygrows, but it doesn't have to be, they can be made from any clothes. They don't have to be children's clothes either, it could be a beloved grandparent's clothes, bridesmaid dresses etc. If they clothes are larger childrens' sizes or adults then you can send two items. You can send more if you wish, as many of them as possible will be used but if there are entire pieces of clothing that are unused they will be returned with the completed order. The fabric composition of the quilts clearly varies given the items you send in. However, the wadding and fleece are 100% polyester. Again, care instructions are largely dependent on the items included by you, but we would recommend washing on a delicate cycle at no more than 40 degrees. The quilts are available in four sizes. 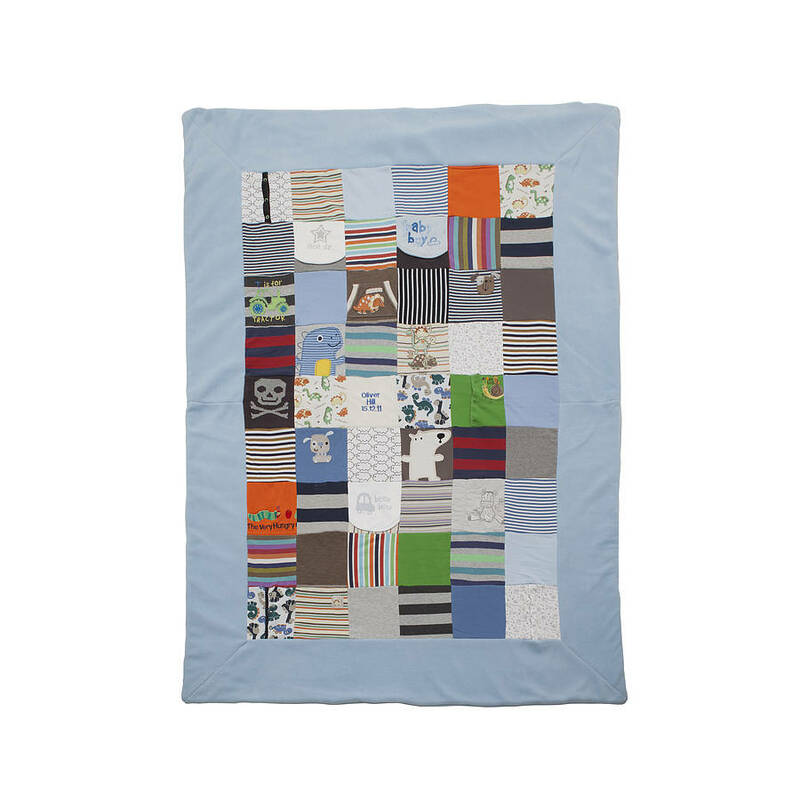 Our Cot Bed Quilt is 105x120cm. Our Single Bed Quilt is 120x165cm. A double bed quilt is 165x165cm and a king size is 150x200cm. This product is dispatched to you by LoveKeepCreate. Delivery is by tracked and signed for courier. We do delivery to Europe and the USA. Our charges for one product are displayed as you checkout. However, if you are outside of the UK and wish to order more than one item please contact us via the 'ask the seller a question' button on the product page so that we can calculate postage for you. IMPORTANT: this information overrides the information in the table below. Our standard service is to get your order to you four to six weeks after we receive the items of clothing. If you use our express service this can be reduced to two weeks. If you opt for the gift option the card will be dispatched within 2-5 working days.